Good morning. It is my honour to join you today to celebrate the Golden Jubilee of the Hong Kong Productivity Council. First of all, I would like to extend my warmest welcome to all of you, especially our distinguished guests from other parts of the world. Since the dawn of civilisation, human beings have been dedicating their creativity and energy to chart a smarter future. The discoveries and inventions of our ancestors and fellow citizens have made our lives safer, healthier and easier, relieving us of our daily chores and leaving us with more time to indulge in our creative activities. The spirit of seeking a "smart future" is indeed ingrained in our DNA. The theme of today's conference is "Smart Future: A Global Perspective". Assembling here today are world-class experts, scholars, entrepreneurs and policy makers who will share with us their insights and experience in the pursuit of a "smart future" from different aspects, from building a "smart city" and developing "smart industry" to the long-term well-being and prosperity of our future. Enhancing city management and improving people's livelihood through innovation and technology are key to sustaining the development of smart metropolises like Hong Kong. The Hong Kong Special Administrative Region (HKSAR) Government attaches great importance to the smart development of the city. 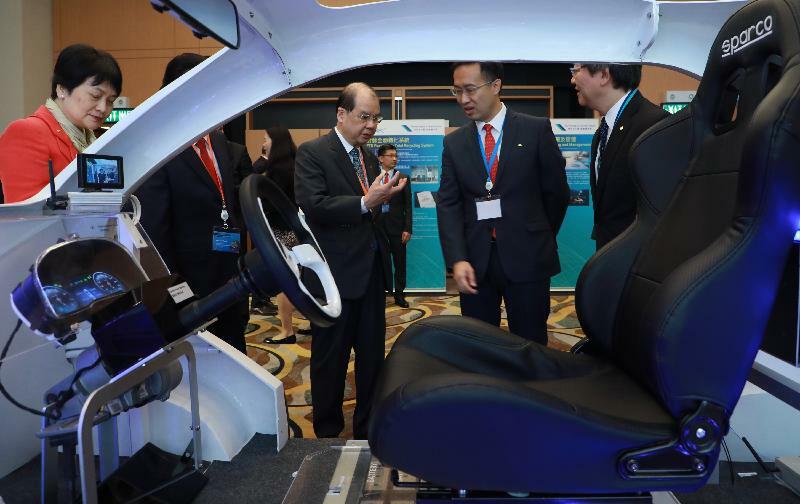 To this end, we have set up the Innovation and Technology Fund (ITF) to promote innovation and finance applied research and development projects that contribute to innovation and technology upgrading in industries in Hong Kong. There are various funding programmes under the ITF, including the Innovation and Technology Support Programme, the University-Industry Collaboration Programme, the Enterprise Support Scheme and the Patent Application Grant. One of the key purposes of these funding programmes is to encourage more research and development collaborations between universities and enterprises, thereby promoting re-industrialisation. We have also established a HK$2 billion (US$260 million) Innovation and Technology Venture Fund, partnering with private venture-capital funds to help finance promising local technology start-ups. We have also introduced the HK$500 million (US$64 million) Innovation and Technology Fund for Better Living to encourage the use of innovation and technology in developing projects that bring more convenience, comfort and safety to daily living. To give further impetus to innovation and technology development in Hong Kong, we have reserved HK$10 billion (US$1.3 billion) for this good cause. 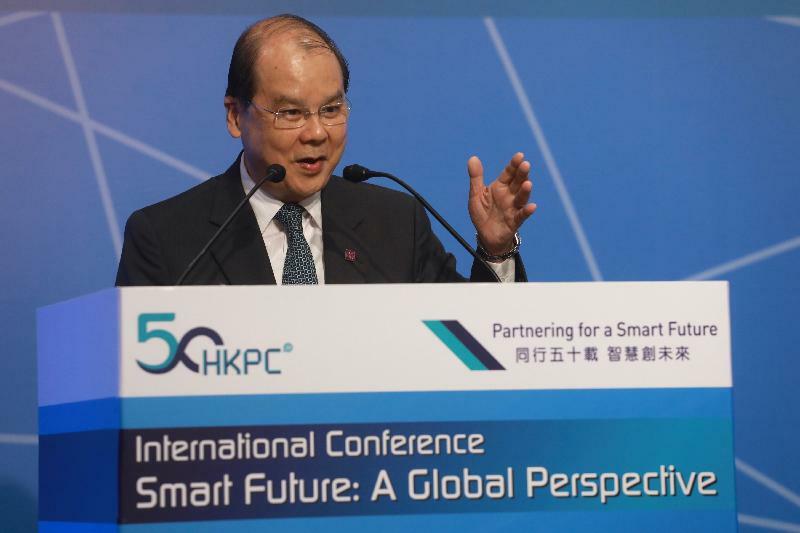 To gear up for a new era of economic and technological transformation, the Hong Kong Science and Technology Park Corporation (Hong Kong Science Park) and the Hong Kong Applied Science and Technology Research Institute jointly operate the Smart City Innovation Centre. It serves as a communications platform for research and development professionals, technology companies, business enterprises, start-ups and public service providers to develop innovative solutions such as FinTech, 5G, smart governance and smart living. The Government has also completed a study that aims to formulate an overall smart city framework for Hong Kong. The study report stresses the importance of collaboration between the public and private sectors and proposes a strategic framework that covers short-term, mid-term and long-term measures in six key areas that are key components of our daily lives, namely mobility, living, environment, people, government and economy. We are seeking views from the public and will analyse the comments and suggestions collected before we finalise the smart city blueprint for Hong Kong. While we are moving towards the smart city target at full speed, we put great emphasis on engineering the re-industrialisation movement in Hong Kong. To achieve this objective, we need a critical mass of local smart industries to work together to advance the value and creativity chains through innovation and technology. The Government is determined to support the development in the process and strive to promote smart production, attract high value-added technology and encourage high value-added manufacturing processes. The Hong Kong Science Park currently provides a total of 330,000 square metres of office area in 21 office blocks, with a view to building a tech-based ecosystem that connects stakeholders, nurtures talent, facilitates collaboration and drives innovation to commercialisation. To facilitate the long-term innovation and technological development in Hong Kong, we are fully committed to supporting the HK$4.4 billion (US$560 million) expansion of the Hong Kong Science Park for local innovation and technology industries. Two buildings will be built on a 1.18-hectare site west of Science Park Phase 3. By 2020, the new 14- and 15-storey towers will provide 22 per cent more office space than is currently available. In addition, a Data Tech Hub and an Advanced Manufacturing Centre are being developed by Hong Kong Science Park at its Tseung Kwan O Industrial Estate for completion in early 2020s. Another exciting development is the 87-hectare Hong Kong-Shenzhen Innovation and Technology Park in the Lok Ma Chau Loop area near our boundary with Shenzhen. This will complement the development of the Guangdong-Hong Kong-Macao Bay Area. A key base for co-operation in scientific research will be established in the Park. Potential areas for development include robotics, biomedicine, smart city and financial technology. The Loop will be a powerful engine to create more synergy with Shenzhen's strong manufacturing capabilities and new platforms to tap into the huge Mainland market, taking co-operation among the industry, academic and research sectors to a new height. However, the Government's effort alone is never enough. We need the support and participation of different sectors of the community. The Hong Kong Productivity Council has all along been the Government’s important partner in transforming our local enterprises into smart enterprises. Earlier this year, we engaged the Council to establish an Inno Space to provide workspace and technical support to assist users in turning their innovative ideas into industrial designs and even further to become products. The Inno Space is designed for public use and will commence operation later this year. I encourage our start-up entrepreneurs, students and graduates to make good use of this wonderful innovative facility. The Council also plays an active part on the international level in promoting smart industry. It was officially accredited as an Industry 4.0 Expert by the Fraunhofer Institute for Production Technology in 2016 and since then has organised a series of activities including the Industry 4.0 Upgrade and Recognition Programme to help relevant industries gain a better understanding of Industry 4.0. I feel most encouraged to note that the Massachusetts Institute of Technology (MIT) will officially open its Hong Kong Innovation Node in the Hong Kong Productivity Council Building this Sunday (September 24). The focus of this innovative institute is on cultivating the innovation capabilities of our students, increasing opportunities and accelerating the path from idea to impact, working together with alumni, affiliates and friends in the community to help galvanise the region’s innovation ecosystem. The Innovation Node will certainly deepen the MIT’s links to Hong Kong and the region, while strengthening Hong Kong’s position in the Bay Area development and the Belt and Road Initiative. Ladies and gentlemen, the HKSAR Government is committed to promoting the development of innovation and technology. 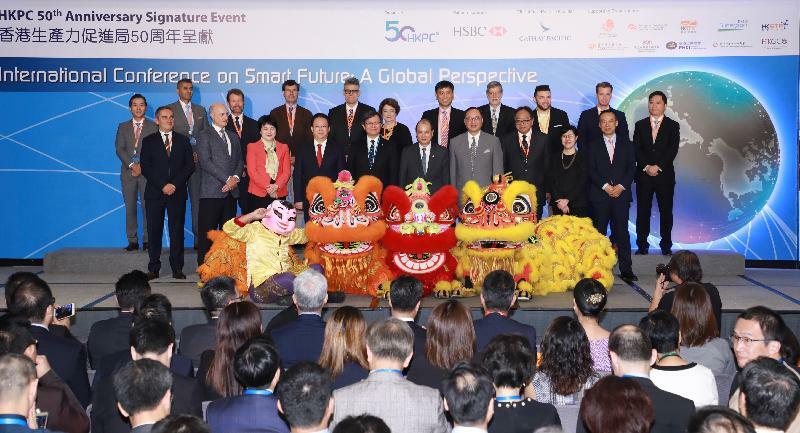 Over the past 50 years, the HKPC has played an important role in supporting the transformation of Hong Kong's industries. I am confident that the HKPC will continue to be our close partner with the industries to capitalise on the fast-changing innovation and technology environment and capture new opportunities in this new "smart" era. On this note, I wish the conference every success and all of you a fruitful experience, and our guests from overseas an enjoyable stay in Hong Kong. Thank you.